Coro Casa da Música gave its first concert in 2009 under the direction of Paul Hillier, its principal conductor. Based around a core membership of 20, the choir is regularly enlarged to take on medium and full symphonic choral duties, fulfilling a key role in the performance of repertoire from the Renaissance to the present day, both a cappella and with orchestra. They perform with the other groups of Casa da Música, its symphony orchestra, baroque orchestra and Remix contemporary music ensemble. Coro Casa da Música has been directed by the conductors James Wood, Simon Carrington, Laurence Cummings, Andrew Bisantz, Kaspars Putniņs, Andrew Parrott, Antonio Florio, Christoph König, Peter Rundel, Simon Hasley, Phillip Pickett and Paul Hillier, with symphonic choral concerts that included Beethoven’s Choral Symphony, Bomtempo’s Requiem à memória de Camões, Brahms’s A German Requiem, Mahler’s 3rd Symphony and other works with orchestra. The a cappella programme regularly includes Portuguese music, as well as a wide variety of thematic concerts. They have presented the Portuguese premieres of various works and the world premiere of Carlo Gesualdo’s Motets, in a version reconstructed by James Wood. 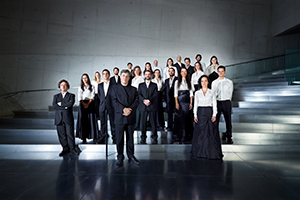 Coro Casa da Música has performed in Lisbon, Alcobaça, Tomar, Batalha and Arouca making a tour of Portuguese World Heritage Monasteries. They also travelled to the Azores and to Spain, to take part in the Úbeda y Baeza Early Music Festival, and performed at the Handel Festival in London. In 2012 they return to England to take part in the Huddersfield Contemporary Music Festival.